Looking for some great family fun? 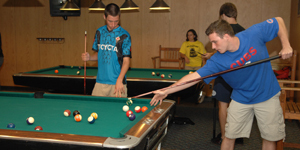 Visit the Illinois State University Bowling & Billiards Center at the Bone Student Center. You’ll enjoy bowling, billiards, video games, and more! All at great, affordable prices. Visit us today and let us show you what fun is all about! The Bowling & Billiards Center opened in 1972 and contains 17 billiards tables and 10 bowling lanes. This building was formerly the Student Recreation Building. Limited meeting space is also available.